An under-trained runner with a positive attitude will beat a trained runner with doubts every time. Just relax, run smart and enjoy the sights, sounds and ... Pain! You work hard to feel this bad, savor it, as the rest of the world lives in a couch potato haze you are fully alive and diggin' it! In all distance events, 9 out of 10 world records are set when running negative splits, a faster second half. A difficult concept to get your head around in a long race: the idea that you will pick it up. Going out too fast is the number one mistake, every minute you are ahead of schedule is a potential to walk 10 minutes at the end; it is not money in the bank. Don't do it! For those who heed my words, I'm proud of you already! Randy Step, an admitted obsessed runner who loves the long run, an event that continues to offer self discovery, keeping the fire lit. The Obsessed Runner seems to have been abducted by Leprechauns or possibly Martians. We're not really sure, he was here, there was a flash of green, he was gone! Come to Shamrocks & Shenanigans on March 13 or the Martian Marathon on April 2 & help us look for him! With less time off the road, we'll finally have time to shop for new running stuff! See you at the serious sale this weekend at Running Fit! PS: Just a heads up, Bayshore opens registration tomorrow, December 1st, and all events will fill in a few hours, YIKES! PS: Fire up the Kids to run the Martian Kid's Marathon! Bring 'em to the mile at Dexter's Holiday Hustle on Dec 3! Naughty or nice, walker or runner, come breathe in the December night air and give back to others. A silly, hilly out and back course that will take in the neighborhood light displays and give you a chance to see the flashing gang ahead or behind you! This charity event donates $5 of your entry fee to local Dexter charities. Bring canned or non perishable food items for the needy and get a raffle ticket for each item! Raffle items from Running Fit to include 2 $50 gift cards, 4 $25 gift cards, gloves, hats, bags and more! PS: Save the Dates! Bike Trainer Rides at the Fit! Looking for some company on those long lonely trainer rides this winter?? Come join us at Running Fit for Trainer Rides and Movies! NEW THIS YEAR - PEDAL FOR PRIZES!! Come and join us at either location and start logging your minutes! For every 15 minutes you log at either Running Fit location you will collect a point! 10 points gets you your first prize and then you will be hooked! An opportunity to hang with some like-minded folk, watch a movie on the big screen. Different movie every week....and we can't guarantee it will be rated G.....don't tell your Mom! Bring your bike and your choice of stationary trainer and be ready to ride. If you plan on working up a sweat, you better bring a towel for the floor too! Winter, the real deal! Finally, some decent weather to test our resolve and earn true satisfaction for our super human efforts! Yee Ha! It feels good to get the dust off the YakTrax and put in some winter miles with no wimps in sight. Yes, It's a busy time of year, but don't let the Holiday rush get you down and don't stress about your running, just getting out the door is all that is needed to call it a successful run, forget distance or pace, no torture necessary, just overdress and run short. Not to worry, we will soon we hit a new year with new goals and a more serious schedule, but for now, chill ... But only after that short, fun run! I often bring up the importance of sharing the gift of running. That said, many of us may be just a bit too excited about our sport, especially while training for an event. (OK, what I mean is you might just share my problem!) We need to be sensitive to our non-running friends and family members who might not be excited to hear about our workouts, long runs, total weekly mileage, pace or race plans. The best way to share our joy is to let them see that that we are productive, fit, helpful and concerned... if they get the idea that our running contributes to that, the gift has been shared. Do you want to see my race medals? Randy Step, an obsessed runner who ... has nothing more to say. PS - I'm getting ready to camp out on the land and set my soul free! Run any or all of the weekend events, a great way to get in marathon training mileage or just a much needed hippy hike and perhaps a bit of Yoga... Peace Out. 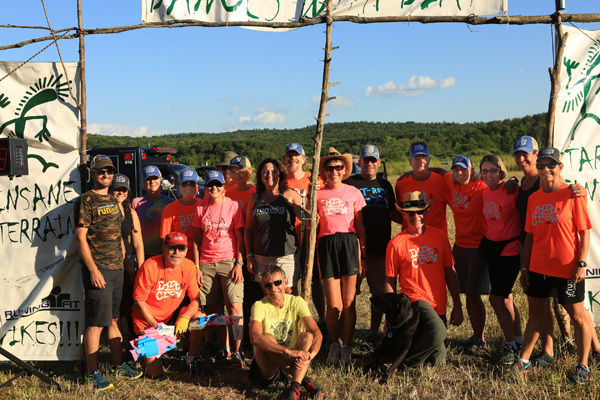 On top of all the "thanks" and "you rock" you will get throughout the day, you also get an awesome volunteer shirt, a $30 coupon toward any Running Fit event (includes race shirt) and a great feeling for giving back to your sport!